Wall rack to anchor our range of storage accessories for Singular WOD cage equipment. It's time for a bit of spring tidying. Wouldn’t you love to have all your equipment tidied away in a small space? With the multifunction rack you can. It is made from structural steel with a black stove-lacquered powder paint coating finish. Thanks to the quick release pin system, you can anchor any cage accessory or storage material such as plate storage posts or even use the dip station for cages without the need of a Singular WOD structure. Don’t risk anything when training with heavy loads. Use our safety supports for racks and squat or bench press without risk of accidents. If you want to work your triceps, this is the tool you need. 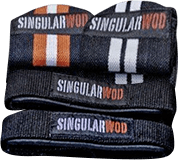 Use it with any Singular WOD cage or if you do not have one, with our multifunctional rack.